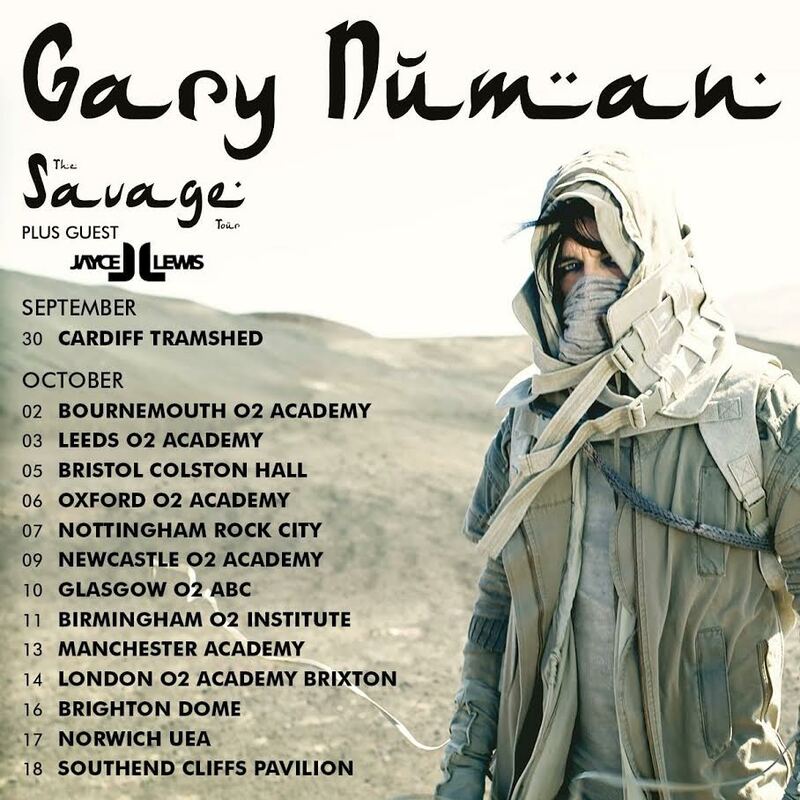 Tonight Brighton, or more specifically The Dome, is to become synth central as electro-industrial pop pioneer and overlord Gary Numan sweeps through in support of Savage (Songs From A Broken World). As the 21st release from Numan, by and large, the queue outside the venue is populated by folks of a far older generation than myself. It’s very amusing to look across the sea of balding heads during his set. That’s another story though. Regardless, the show tonight is entirely sold out as the evening’s crowd cram in to see Numan for the billionth time. First on however is upcoming Welsh act Jayce Lewis who strike most almost instantaneously as someone who has clearly been raised in Numan’s school of crossover industrial-fused electronic-pop. Oddly enough, the frame of reference I’ve been using since is, at their heavier end they resemble members of Rage Against The Machine, The Devin Townsend Project and Black Sabbath playing faithful covers from every province of Gary Numan’s expansive career. Despite suffering from self-diagnosed “Chronic man-flu”, Lewis takes to the slot and rolls out tracks from his first two records in addition to this year’s “Shields” which dropped this September. The initial lukewarm reaction is undeniable, though it seems uncomfortably true to be the result of the audience demographic. Synth-heavy set closer “Electric Medicine” is obviously a well-known one tonight and gets an enthusiastic response. Perhaps a support act who resembled the headliners less strikingly would’ve fared better tonight though. Nevertheless, they certainly deserve due credit for the heart, soul and child-like enthusiasm. They were obviously very pleased to be there and for those in attendance who wanted to hark back to an earlier era of Numan, they got their fill. A tuneless football-esque rally cry of “NUUUMAN” drones around the venue as the band walk on, draped in semi-see-through cloth similar to Savage‘s album cover. By beginning with album opener and easily the best song off the new record, “Ghost Nation”, they solidify the fact that despite their ageing audience, they are not resting on their laurels. Topping the UK independent releases chart with the record earlier in the year (his second highest charting album since 1980! ), they show that as recording and performing artists, they are still relentlessly relevant. In fact, over half of the set played tonight is post-2000 material, showing the significance of Numan‘s rebirth through influencing everyone under the moniker of industrial, electronic, new wave etc. They go on to play a whopping 6 tracks from the new record too. When bands shy away from playing new songs, that’s when you should be skeptical. Nevertheless, I digress. The band adopt a seemingly less scripted onstage presence than Jayce Lewis as they play through songs from every avenue they have ever explored creatively. It feels loose, totally unforced and completely natural in the way they move and act tonight. This could be perceived as disingenuous and half-hearted, though I’m loath to label it that. Rather, it feels like a group of guys playing music on cruise control as a bunch of mates. Just north of the halfway mark, a mic is brought on for Numan’s daughter Persia to perform lead single from Savage; “My Name Is Ruin” which is no new stunt in their sets but is always a touching moment. This gives way to the hands-down-classic “Cars” and the finishing run of “When The World Comes Apart” and “A Prayer For The Unborn”. After a short while offstage and numerous, slightly more-drunken verses of “NUUUMAN”, the band appear back onstage for “I Die: You Die” and a final stone cold set standard; “Are Friends Electric” and despite the set reeling out the best of a very good career, it’s this closer that’s the highlight. It’s just an undeniable anthem in these circles and is no differently received tonight than it is every night. While this is no standout performance from the band, they show over the course of the night that it doesn’t need to be. They’re clearly at home tonight in The Dome, practically walking through their set with immense ease. Gary’s done his job though and the crowd lap it up for the nth time.